On a June day at the Orb Weaver Farm, the tomato trellises danced in the afternoon breeze, the calves munched on grass in the distance, and two generations of Orb Weavers settled under a tree to chat with some of us at the Intervale Center about the farm’s transition. Marian Pollack and Marjorie Susman decided to farm and make cheese forty years ago and since then, they have grown a bountiful garden, constructed a cheese cave, built a farmhouse, and inspired Vermonters with their gritty determination and commitment to making quality products. Retirement was the original plan when Pollack and Susman reached out to the Intervale Center’s Farm Business Services Team, but when the two women met Kate Turcotte and Zack Munzer, an alternate plan revealed itself. 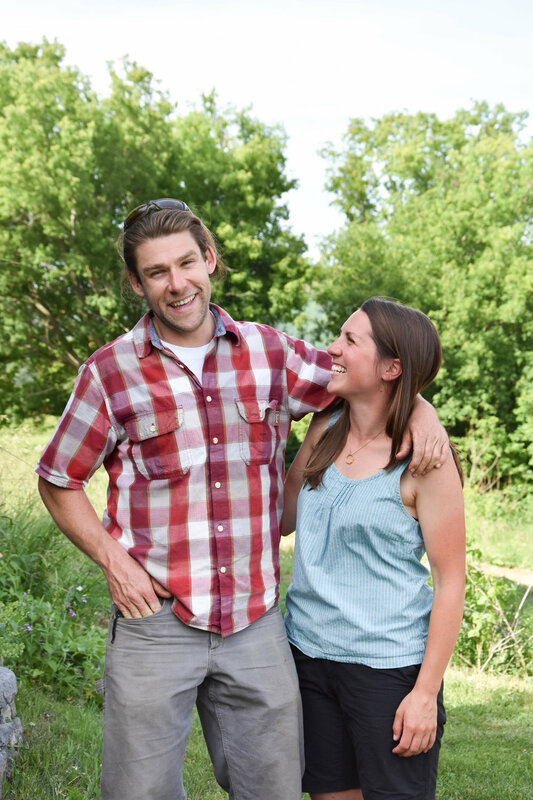 Starting this year, Turcotte and Munzer will take over the cheese-making operation, while Pollack and Susman continue to grow vegetables for local co-ops and farmer’s markets. 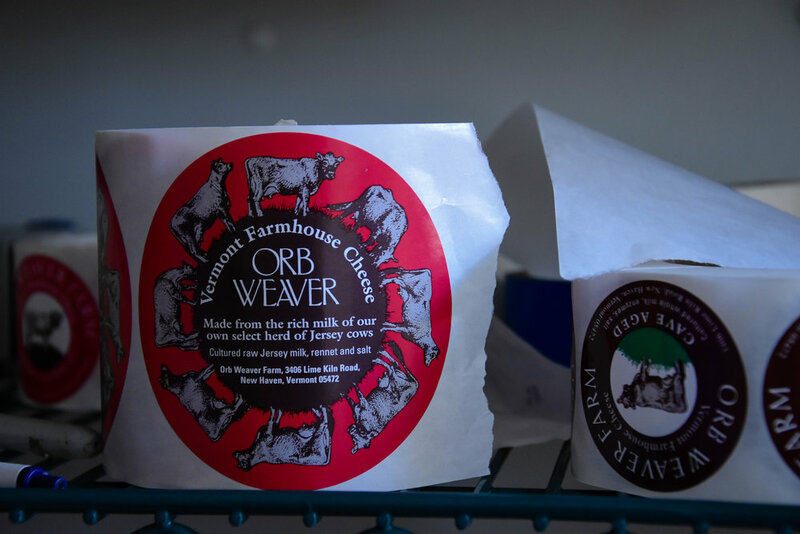 The cheese-lovers of Vermont probably let out a collective sigh of relief when they heard that Orb Weaver products will continue to be a mainstay in the cheese aisle. “It’s really important that we share core values,” Pollack chimed in. Building a relationship was also essential to Kate and Zack. “It’s the only way we know how to do it,” Kate said, in reference to the many evenings the two couples have spent sharing meals or just chatting with one another. Beyond forging a friendship, Pollack and Susman have also provided invaluable guidance and support. While Turcotte is an experienced cheese maker and Munzer is more than capable with the cows, the couple is willing to admit that they have a lot to learn. Donin echoes their sentiments when discussing the IC’s work with farm transitions, emphasizing an element of non-attachment. There are a million different factors that weigh on farmers’ decisions and ultimately, those choices are their own. The IC provides an outside perspective and often uses examples from other farm transitions to illuminate all the options available. For example, the Intervale Center helped the group work through a few potential transfer scenarios and that they settled on a lease-to-own model. Transition consulting is a lesser-known aspect of the IC’s work compared to some of our initiatives around land access and business planning. “Most people hear about it through word of mouth,” Smith informed me. But as the farming population gets older, these services are perhaps more needed than ever. An estimate from the National Agricultural Statistics Service states that “over the next five years—the lifespan of the next farm bill—nearly 100 million acres of U.S. farmland are expected to change ownership and will need a new farmer.” It is exciting that young farmers like Turcotte and Munzer are ready to dive into a project like running Orb Weaver. Turcotte is especially excited to have more attachment with her products and see a better feedback loop than she does with the cheddar she makes right now. As for Pollack and Susman, they will continue to tend to their garden and cook in their adorable kitchen–where the counters were built perfectly for their height. In the colder months, when they used to make cheese, they will have much more free time. They look forward to long walks around the farm. Susman is even considering learning how to blow glass. Joe Adler and the Veils of Summer at Summervale!